Interest rate changes – interest rate hikes may cause the bond price to decrease. Liquidity risk – less liquid bonds can become more difficult to sell at or near their real value. Government securities risk – not all bonds of the US government are backed by the full faith and credit of US treasury. Leverage Risk – depending on each fund, some funds may use leverage to enhance the fund performance. Inflation protection investment risk – interest payments on inflation protected bonds can be unpredictable due to economic factors and other risks. 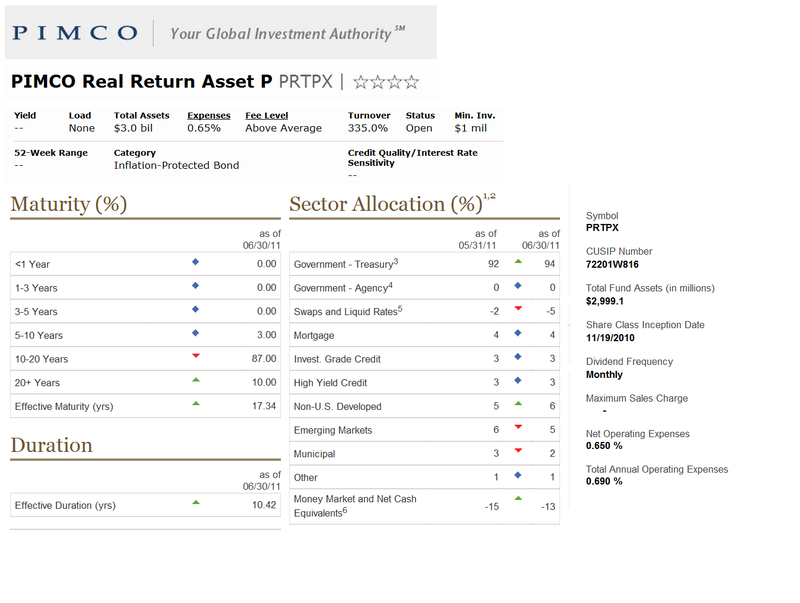 As the top performer inflation protected bond fund, this PIMCO Real Return Asset fund objective is to achieve maximum real return. The fund typically invests majority of assets (>80%) in inflation-indexed bonds of varying maturities. This PIMCO fund invests mainly in investment-grade securities, but may invest up to 20% of assets in high-yield securities rated B or higher. Some of these assets (<30%) may be invested in securities with foreign currencies denomination. This inflation protected bond fund has been managed by Mihir Worah since December 2007, but the fund was introduced to public in November 2010. The expense ratio of this fund is 0.65% per year. The last dividend distributed by this fund was in June 2011 as much as 0.07%. This is a no load fund, so there is no management fee and no front-end sales load fee. This fund has YTD return of 6.91%. The other class of this fund is Class Institutional (PRAIX). 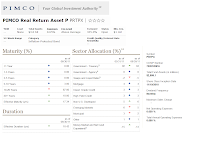 The top sector allocations of this fund as of June 2011 are Government Treasury (94%), Non-U.S. Developed (6%), Emerging Markets (5%), Mortgage (4%), Invest Grade Credit (3%) and High Yield Credit (3%). 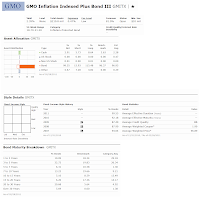 The GMO Inflation Indexed Plus Bond investment is to seek total return in excess of that of its benchmark, the Barclays Capital U.S. Treasury Inflation Notes Index. The fund’s investment program has two principal components. One component is designed to track its index benchmark return. The second component seeks to enhance its value relative to that benchmark by exploiting misvaluations in global markets beyond its index. It usually invests majority of assets (>80%) in inflation indexed bonds. Thomas Cooper has managed this fund since its inception in June 2006. This fund has a yield of 2.39%. It has distributed a dividend of $0.53 as of July 14, 2011. This fund has an annual expense ratio of 0.39%. This GMO fund has no sales load. The annual holdings turnover as of July 2011 is 81.0%. Since its inception, this fund has returned 11.92% over the past year and 4.80% over the past five years. 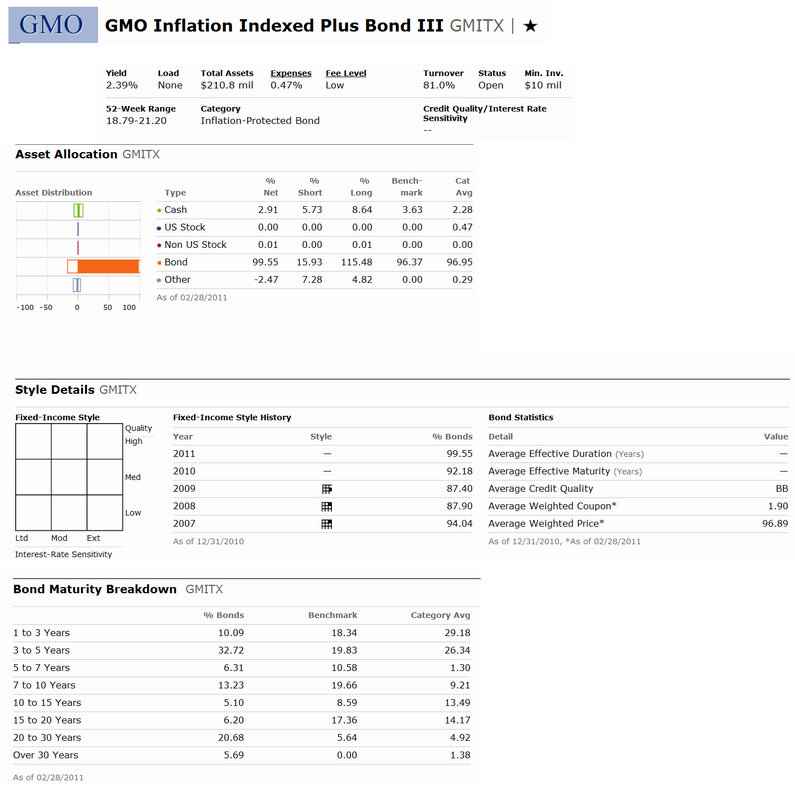 The other class of this fund is GMO Inflation Indexed Plus Bond IV (Ticker: GMIPX). 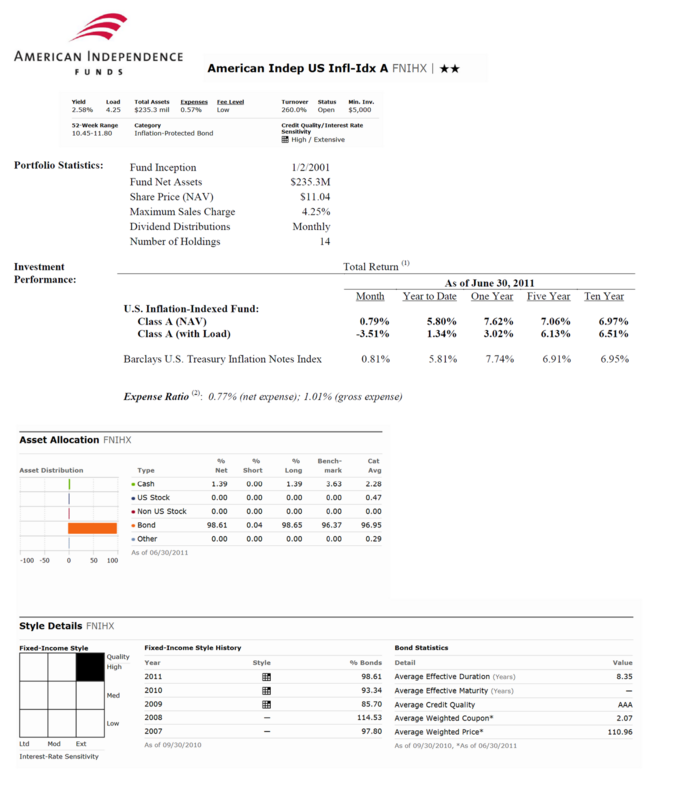 The benchmark of this fund is BarCap US Treasury US TIPS TR USD. The top sector weightings as of February 2011 are Credit (57.46), U.S. Government (37.25%), Foreign (3.03%) and Mortgage (2.25%). The DFA Inflation-Protected Securities fund is seeking to provide inflation protection and earn current income consistent with inflation-protected securities. The fund mainly invests in inflation-protected securities issued by the U.S. government and its agencies. This DFA fund invests most of net assets (>80%) in inflation-protected securities. The fund can invest more than 25% of total assets in Treasury bonds, bills and notes and obligations of U.S. government agencies. This DIPSX fund has been managed by Stephen A. Clark since February 2010. The fund annual expense ratio is 0.13% which is quite low compared to the average in the Inflation-Protected bond category (0.84%). This is a no load fund, meaning it has neither 12b1 fee nor front end sales load. The fund’s yield is 2.48% for the past 12 months. The last dividend was distributed in June 2011. This DIPSX fund has gotten 4-stars rating from Morningstar. The fund has year to date return of 5.36%. For the past 1 year, this fund has returned 9.17%. This fund has total net assets of $1.69 billion. There is no other fund class for this fund. The DFA fund can be purchased from 21 brokerages. Please check with your brokerage for details. The average maturity is 8.77 years and duration is 7.77 years. The benchmark of this fund is Barclays Capital US TIPS Index. 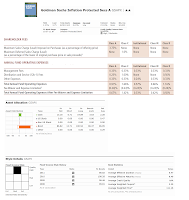 As of April 2011, the asset allocation of this fund is 99.44% in bond and 0.56% in cash. The sector weightings for fixed-income sectors are allocated 100.0% in U.S. Government TIPS. 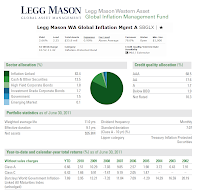 The Legg Mason Western Assets Global Inflation Management objective is to provide total return and current income as second objective. The fund typically invests more than 80% of assets in inflation-indexed or inflation-protected securities issued by U.S. and non-U.S. governments. It may also invest minority of net assets (<20%) in high yield bonds. The fund may invest <10% of net assets in emerging market countries bonds. 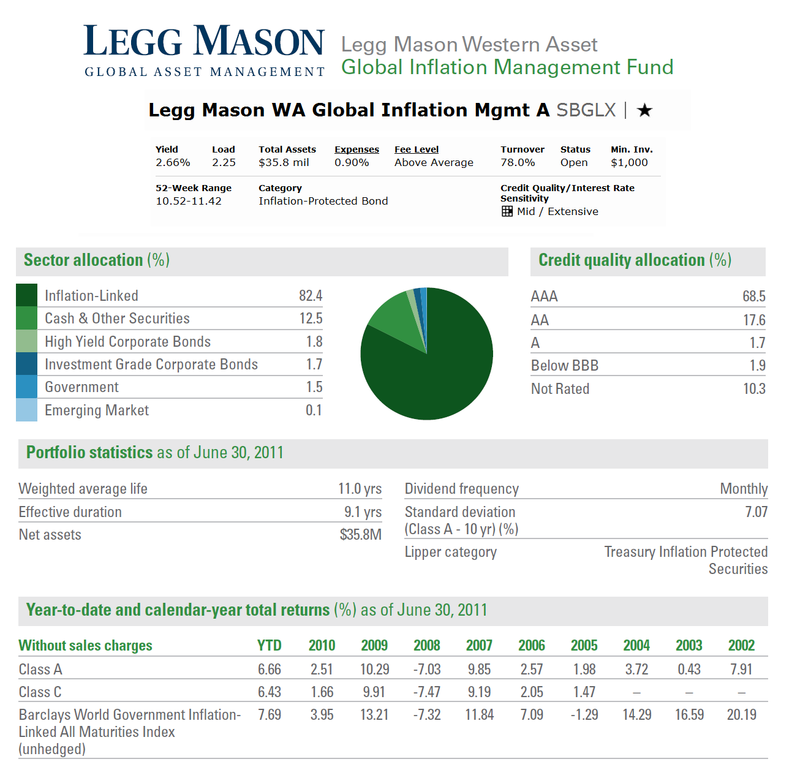 The lead manager of this Legg Mason fund is Stephen A. Walsh. He has managed this fund since March 2006. The SBGLX fund has an expense ratio of 0.90% per year. This fund has a front end sales load of 2.25%. It also has 1 star rating from Morningstar. The minimum initial investment for the brokerage account is $1,000 with $50 minimum subsequent investment. This fund can be purchased from 79 brokerages such JP Morgan, Scottrade Load, Schwab, etc. This fund has recorded 16 years with positive return performance with its best achievement in 2009 with 10.29%. The other class of this fund is Class C (Ticker: SBUFX). As of June 2011, the top sector diversification of this fund are Inflation-Linked (82.39%), Cash & Other Securities (12.50%), High Yield Corporate Bonds (1.80%), Investment Grade Corporate Bonds (1.75%), Government (1.51%) and Emerging Market (0.05%). The American Independence US Inflation-Indexed fund objective is to seek a high level of total return in excess of inflation as may be consistent with the preservation of capital. The fund typically invests most of net assets (>80%) in inflation-indexed securities and derivative that are denominated in U.S. dollar. It invests in derivatives as a substitute for direct investment in inflation-indexed securities. The fund also may invest <20% of total assets in foreign inflation-indexed securities. This FNIHX fund has been managed by Cedric Scholtes since December 2006, but this fund was introduced to public on April 2007. This fund has a yield of 2.36%. The dividend is distributed monthly. The last dividend was distributed in May 2011 (0.09%). It has annual expense ratio of 0.57%. 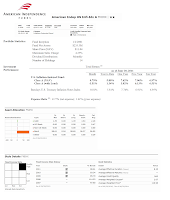 This fund has 0.50% 12b1 fee and 4.25% front-end sales load fee. The minimum amount needed to invest in the brokerage account of this fund is $5,000 with $250 for the subsequent investment. This top performer fund has YTD return of 4.98% and 5-year average return of 7.01%. The annual total return of this fund since its inception are -0.34% in year 2008, 10.79% in year 2009 and 6.10% in year 2010. The 1-year load adjusted returns is 3.54%. The other classes of this fund are Class C (FCIHX) and Class I (FFIHX). The portfolio characteristics of this fund as of June 2011 are 99.7% in U.S. Treasury Inflation-Indexed Securities and 0.3% in U.S. Treasury Securities Cash Equivalents. The fund duration is 7.98 years. The fund’s average U.S. dollar-weighted duration usually will not differ from the average duration of the Barclays U.S. Treasury Inflation Notes Index by more than two years. The JPMorgan Real Return seeks to maximize inflation protected return. The fund generally invests in Treasury Inflation Protected Securities (TIPS). Unlike conventional bonds, the principal and interest payments of TIPS are adjusted periodically to the Non-Seasonally Adjusted Consumer Price Index for All Urban Consumers (CPI-U). In addition to investments in TIPS, this JPMorgan fund may invest in derivatives. The fund also has flexibility to invest in other inflation-linked debt securities. This JPMorgan fund has been managed by Steven S. Lear since August 2009 and Donald Clemmenson. This fund has YTD-return of 5.62%. Since its inception, this fund has recorded 3 years in positive return and 2 years in negative return. Based on the load adjusted returns, the RRNAX fund has returned 3.13% over the past year and 4.28% over the past five years. This fund has a yield of 3.79%. The last dividend paid was 0.07% (June 2011). The annual holdings turnover is 48.0%. This JP Morgan fund has 0.25% of 12b1 fee and 3.75% of front-end sales load fee. The minimum initial investment for either brokerage or IRA account is $1,000 with $25 for the minimum subsequent investment. Investor may choose from the other class of this fund, such as Class C (RRNCX), Select Class (RRNSX) or Institutional Class (RRNNX). 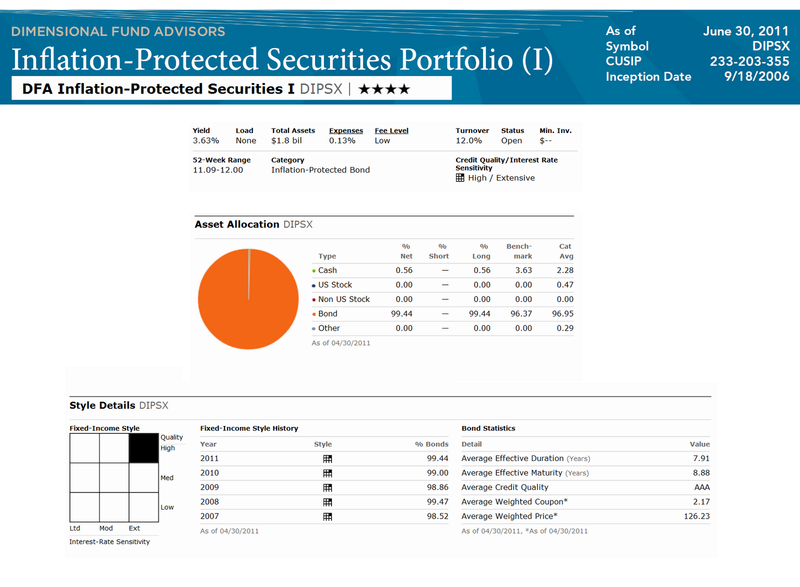 As of June 2011, this fund has 35 holdings. And the portfolio breakdown is 98.4% in U.S. Treasury Obligations, 1.3% in Short-Term Investments and 0.3% in other bond. 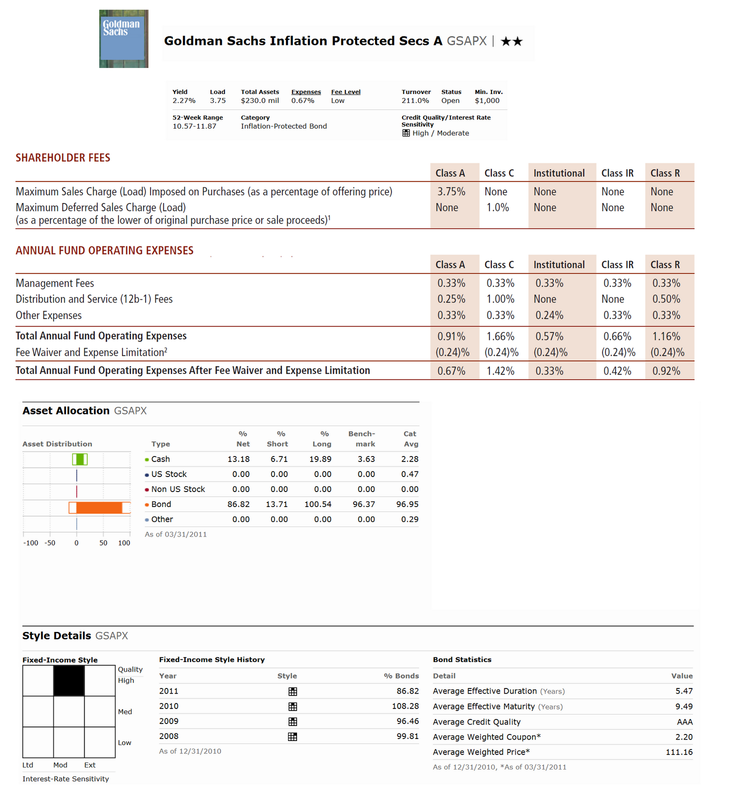 The Goldman Sachs Inflation Protected Securities is seeking real return consistent with capital preservation. This GS fund invests >80% of net assets plus any borrowings for investment purposes in inflation protected securities of varying maturities issued by the U.S. Treasury (TIPS) and other U.S. and non-U.S. Government agencies and corporations (CIPS). The rest of assets (<20%) may be invested in other fixed income securities. Mark Van WYK has managed this fund since its inception in August 31, 2007. This fund has a yield of 2.27% and has distributed $0.09 dividend in June 2011. The expense ratio of this fund is 0.67% per year. If you are interested in this fund, you will need $1,000 for the minimum initial investment for brokerage account. There is a management fee of 0.25% and a front-end sales load fee of 3.75%. This GSAPX fund can be purchased from 64 brokerages. This Goldman Sachs fund has a YTD return of 5.34%. Since its inception this fund has returned 3.11% over the past year and 3.55% over the past three years. The annual total return of this GSAPX fund since its inception is -1.38% in year 2008, 10.36% in year 2009 and 5.94% in year 2010. This fund is available in some other classes, such as Class C (GSCFX), Class R (GSRPX), Institutional Shares (GSIPX) and IR Shares (GSTPX). 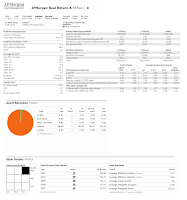 The asset allocations of this fund as of March 2011 are 86.82% in bond and 13.18% in cash. The American Century Inflation-Adjusted Bond is trying to achieve total return and inflation protection consistent with investment in inflation-indexed securities. This American Century fund invests most off assets (>80%) in inflation-adjusted securities including inflation-indexed securities issued by the U.S. Treasury, by other U.S. government agencies and instrumentalities, and by other, non-U.S. government entities such as corporations. Minority of assets (<20%) may invest in traditional U.S. Treasury, U.S. government agency or other non-U.S. government securities that are not inflation-indexed. As part of no load fund, this American Century fund was introduced to public on February 1997. The lead managers are Robert V. Gahagan, Brian Howell and Jim Platz. 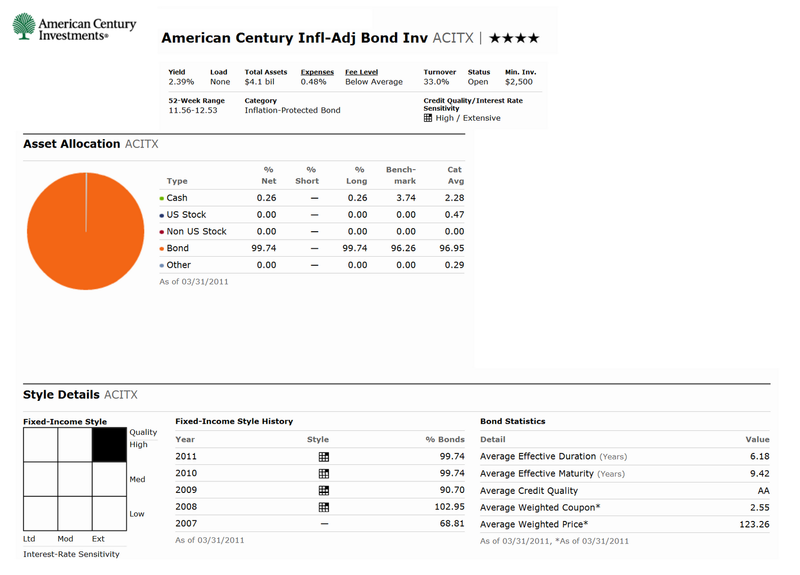 The annual expense ratio of this ACITX fund is 0.48%. It also has a yield of 2.08%. The last dividend was distributed in June 2011 (0.19%). This fund has total net assets of $4.09 billion. The minimum initial investment for brokerage account is $2,500. No IRA account available. This American Century fund is available in many brokerages such as JP Morgan, Merrill Lynch, T Rowe Price, etc. The other classes of this fund are Class A (AIAVX), Class C (AINOX), Class R (AIARX) and Institutional Class (AIANX). Since its inception, this fund has experienced 12 years with positive return and only 1 year in negative return (in 2008 with -1.01%). It has gotten 4-stars rating from Morningstar. The YTD return of this ACITX fund is 4.75%. This fund has returned 7.78% over the past year and 6.39% over the past decade. 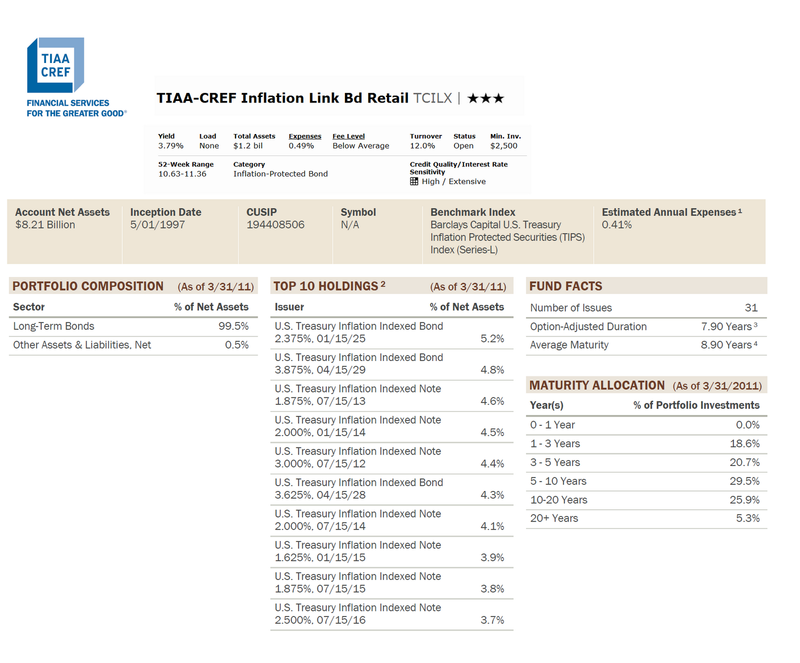 The TIAA-CREF Inflation Link Bond investment is to provide a long-term rate of return that outpaces inflation. 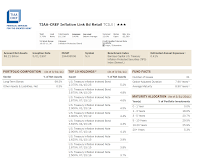 This TIAA-CREF fund invests > 80% of assets in fixed-income securities whose returns are designed to track the Consumer Price Index for All Urban Consumers (CPI-U), over the life of the security. It may invest < 25% of total assets in inflation-linked bonds of foreign issuers. The fund invests < 5% of total assets in fixed-income securities rated below investment-grade or junk bonds. This fund has been managed by John Michael Cerra since August 2008. The total net asset of this fund is $1.2 billion. It has 3.79% yield and 0.49% annual expense ratio. This fund has 12b1 fee of 0.13%, and it doesn’t have any sales load fee. Morningstar has rated this fund with 3 stars rating. The YTD return of this fund is 5.43% and the 5-year average return is 6.35%. The best performance out of the 7 positive return years was achieved in 2007 with 10.98%. The TCILX fund has returned 7.14% over the past one year and 4.62% over the past three years. The minimum initial investment needed for this fund is $2,500 for brokerage account and $2,000 for IRA account. The minimum subsequent investment for both accounts is $100. TCILX can be purchased from 41 brokerages such as Vanguard, JP Morgan, Schwab, etc. 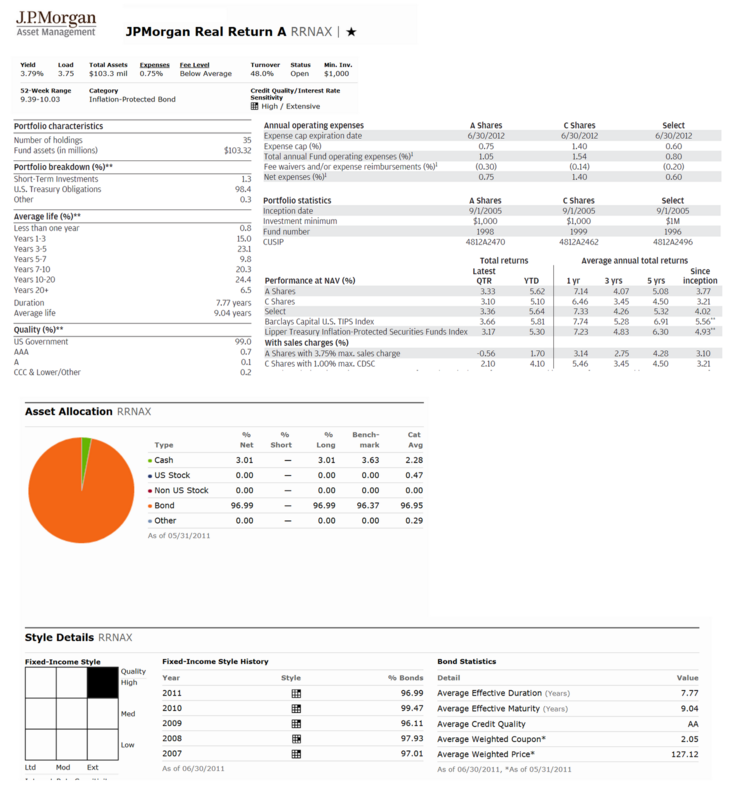 The portfolio composition of this fund as of March 2011 is 99.5% in Long-Term Bonds and 0.5% in Other Assets & Liabilities. The option-adjusted duration is 7.90 years and the average maturity is 8.90 years. The Vanguard Inflation-Protected Securities fund objective is to provide inflation protection and income consistent with investment in inflation-indexed securities. This Vanguard fund invests majority of assets (>80%) in inflation-indexed bonds issued by the U.S. government, its agencies and instrumentalities, and corporations. It may invest in bonds of any maturity; however, its dollar-weighted average maturity is expected to be in the range of 7 to 20 years. This fund will invest in investment grade bonds. John Hollyer has been the lead manager of this fund since its inception in June 29, 2000. This Vanguard fund is a no load fund, therefore it has neither management fee nor front-end sales load fee. The annual expense ratio is 0.22%. The yield of this fund is 2.46%. As one of the biggest fund, it has total net asset of $34.75 billion. The minimum initial investment for either brokerage or IRA account is $3,000 with $100 for the next investment. This fund has performed well by recording 9 years of positive return and only 1 year of negative return (in 2008 with -2.85%). This VIPSX fund has gotten 3-stars rating from Morningstar. And it has returned 7.93% over the past one year and 6.61% over the past ten years. As of March 2011, the asset allocations of this fund are 99.95% in bond and 0.05% in cash. 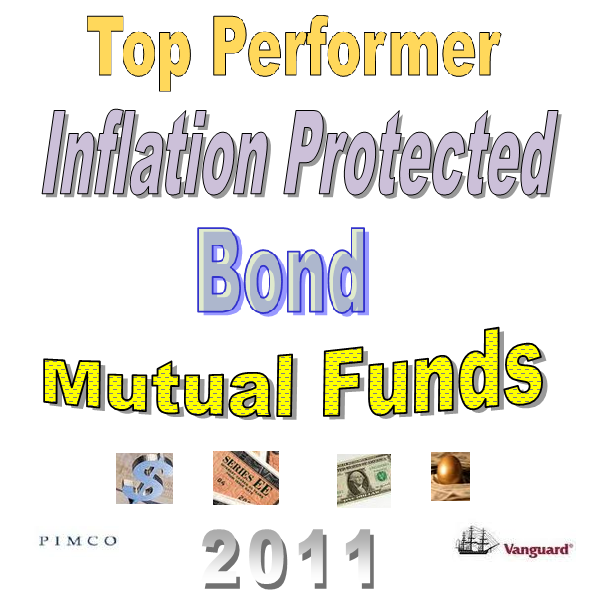 This Hartford Inflation Plus fund is rated number 15 in this top performers list. The Hartford fund is seeking a total return that exceeds the rate of inflation over an economic cycle. This fund invests most of net assets (>65%) in U.S. dollar-denominated inflation-protected debt securities issued by the U.S. Treasury. It may also invest in inflation-protected debt securities issued by U.S. government agencies and instrumentalities. Most of these bonds are investment grade fixed incomes. The rest of assets (<35%) may be invested in securities of foreign issuers and non-dollar securities, including inflation-protected securities of foreign issuers. This HIPAX fund has been managed by John Hendricks since March 2007. This fund was established in October 2002. This fund has a dividend yield of 2.47%. The fund net assets are $2.15 billion. It has annual expense ratio of 0.90%. This fund has 12b1 fee of 0.25% and front-end sales load fee of 4.50%. The minimum amount needed to invest in the brokerage account of this fund is $2,000 with $250 for the subsequent investment. As of June 2011, the top 3 sectors of this Hartford fund are TIPS (91.91%), US Agency (4.72%), and US Treasury (3.37%). The Delaware Inflation Protected Bond fund objective is to provide inflation protection and current income. This Delaware fund invests most of net assets (>80%) in inflation-indexed bonds issued by the U.S. government, its agencies or instrumentalities and corporations. This fund may also invest <10% of net assets in high yield corporate bonds. The fund may also invest <10% of net assets in obligations denominated in foreign currencies. In general, it may invest < 25% of net assets in U.S. dollar-denominated securities of foreign issuers. The fund’s lead manager is Roger Early since May 2007. The fund’s expense ratio of this DIPAX fund is 0.78%. This fund charges 4.5% sales load. It currently has a yield of 2.65%. This fund has total net assets of $396 million. This fund has 3 stars rating from Morningstar. As of May 2011, the fund top5 sectors are TIPS (81.55%), Foreign Government (9.16%), Mortgage CMO (4.94%), Mortgage Pass Thru (3.26%), and US Corporate (1.09%). 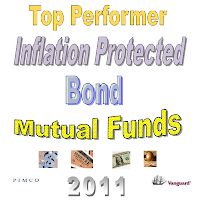 Details about fund information described above, 20 Top Performer Inflation Protected Bond Funds.